With a name like Mango Mango Dessert, you know what you’re getting yourself into before you even enter. 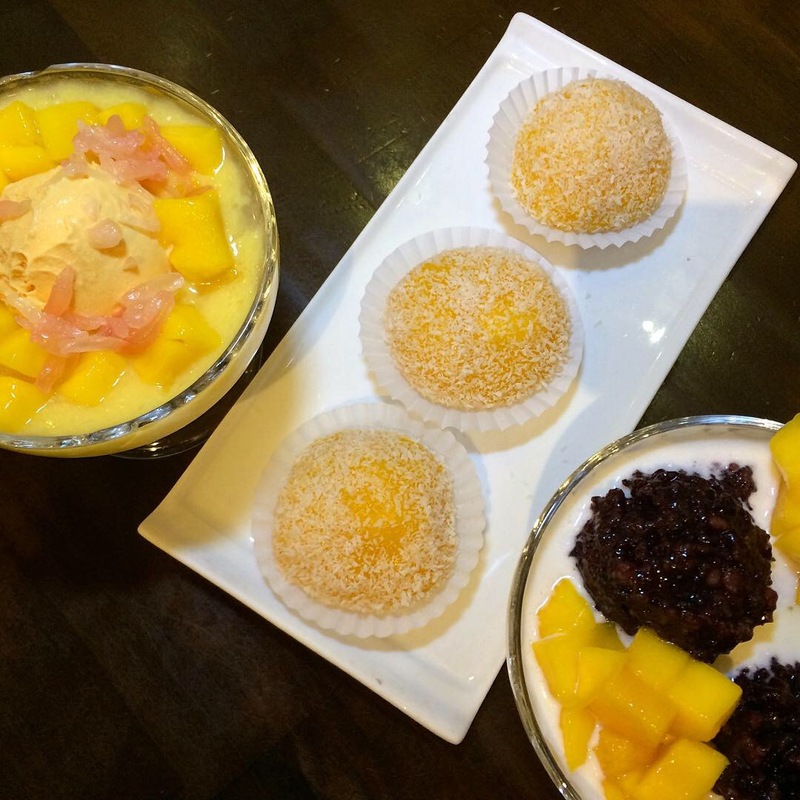 This chain of franchised Hong Kong style dessert and ice cream shops features a multitude of mango desserts of course, but do check the menu for other specialties like mille crepes (the popular thousand layer treat) as well as coconut, durian and other tropical goodies. Four of us descended upon the 136-28 39th Ave location in Flushing and sprung for the Mango Combos A and B.
 Combo A included (left to right): special mango juice, sago (tapioca) and pomelo with mango ice cream, three mango mochis, and snow white juice (coconut) with mango and black rice. 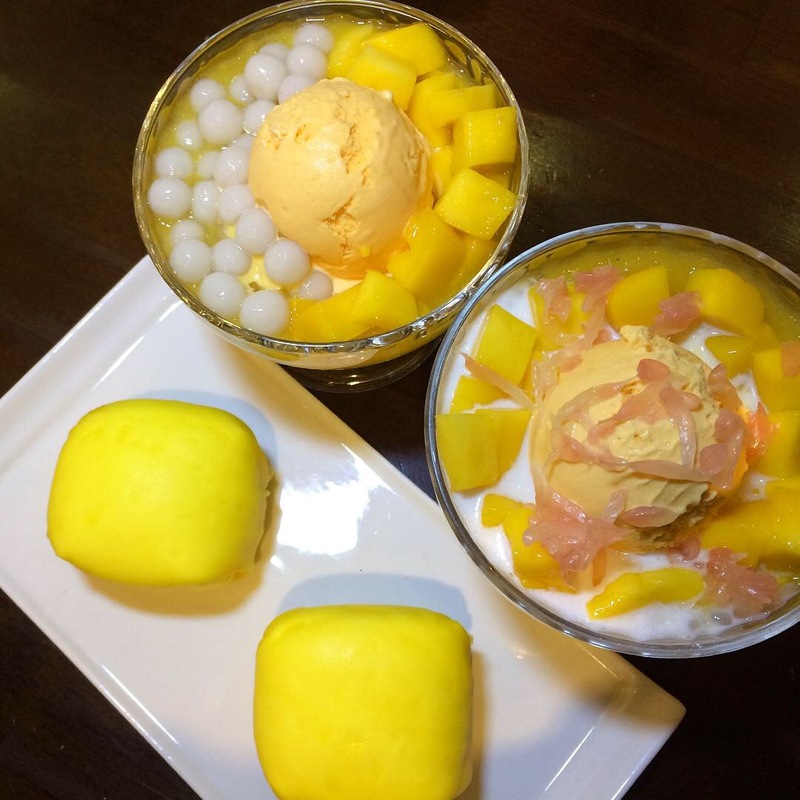 Combo B comprised a pair of mango pancakes, mango juice and glutinous rice balls with ice cream, and snow white and mango juice with sago and pomelo with ice cream. You got a jones for mango? You know where to go, man. Pilar Cuban Bakery, 397 Greene Ave in Bedford-Stuyvesant, Brooklyn, is the recently opened extension of Pilar Cuban Eatery, their restaurant next door. 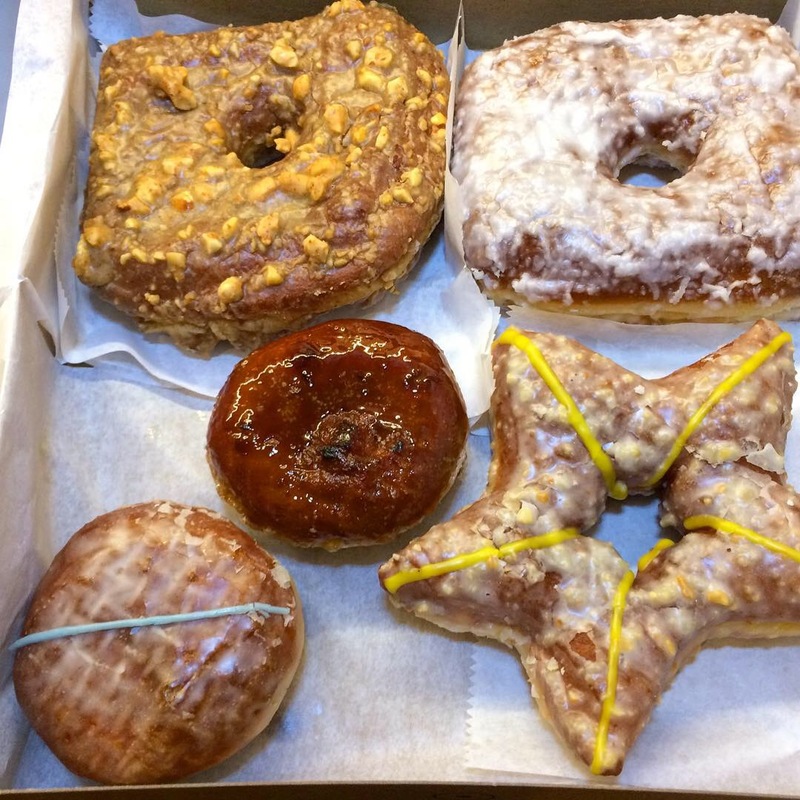 A handful of tables entices you to taste the authentic baked goods on the spot in case you can’t wait to get your goodies home, and trust me, one bite and delayed gratification goes out the window. 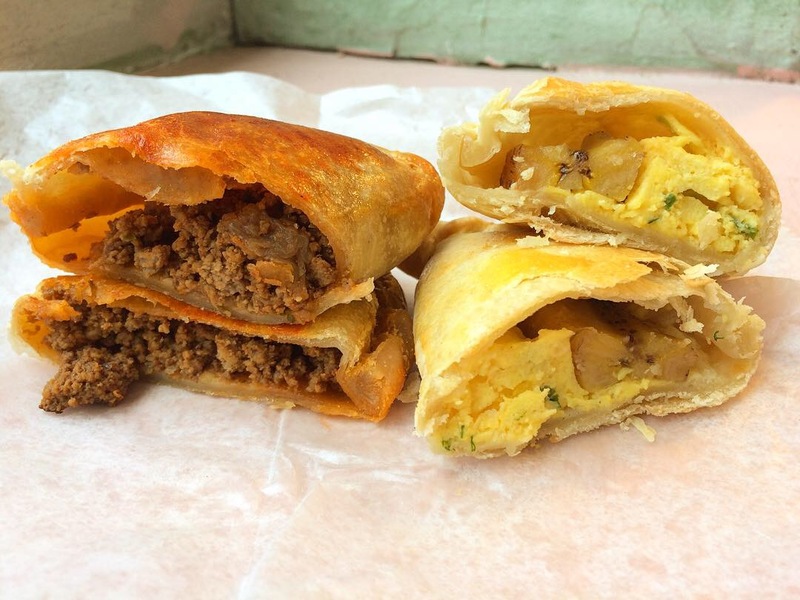 This picadillo empanada was stuffed with ground beef seasoned with a unique sofrito that set it apart from others I’ve tried; the breakfast empanada was brimming with eggs, cheese and plantain (it’s also available with house-made chorizo). 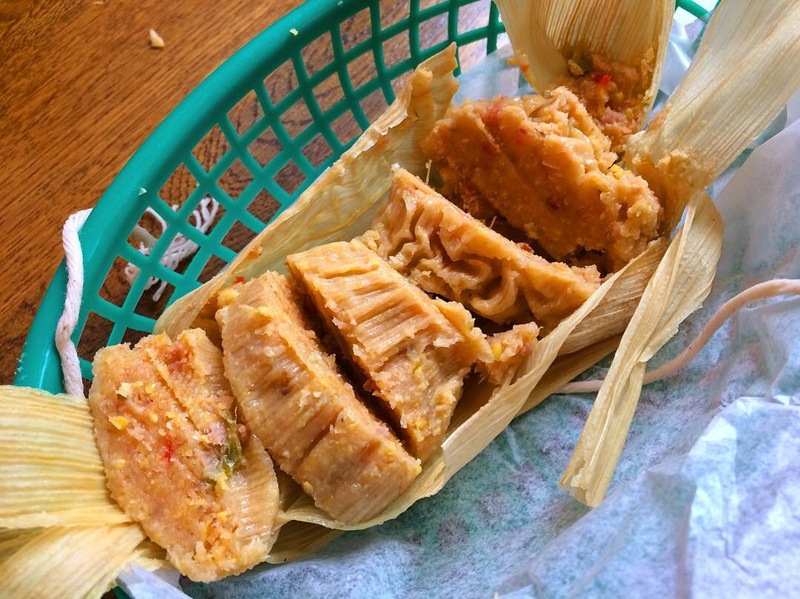 The roast pork tamal was flavorful as well. 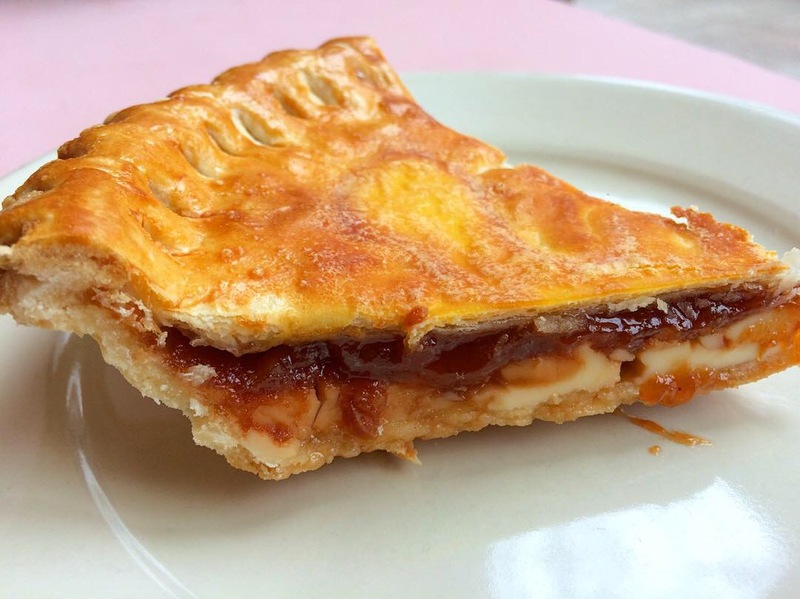 Simply put, the flaky crusted guava and cheese pie killed. Remember that you’re enjoying Cuban cuisine, so if you’re accustomed to a Mexican guayaba y queso pan dulce (not to take anything away from them) this will be a different, delicious experience and worth every calorie. 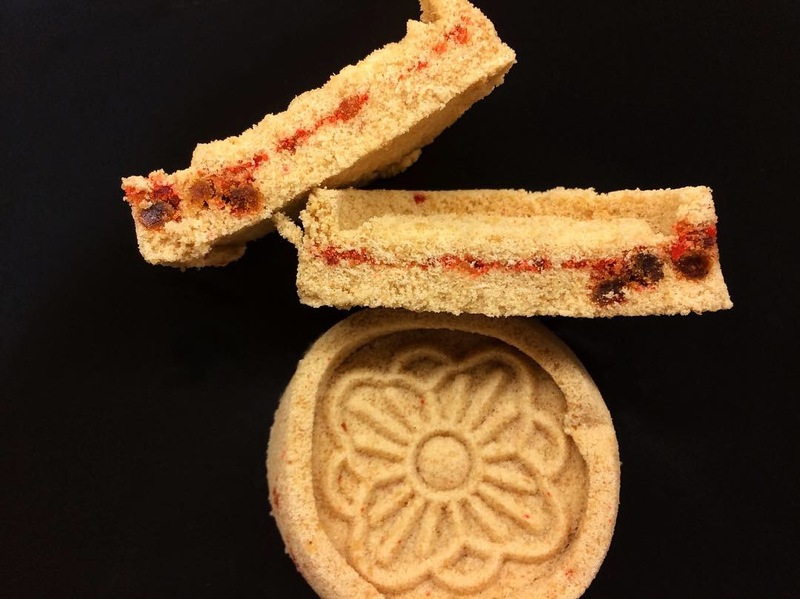 Since we’re on the topic of Asian cookies, you might want to give these Stick Biscuits a try if you see them in a Japanese or Chinese market. 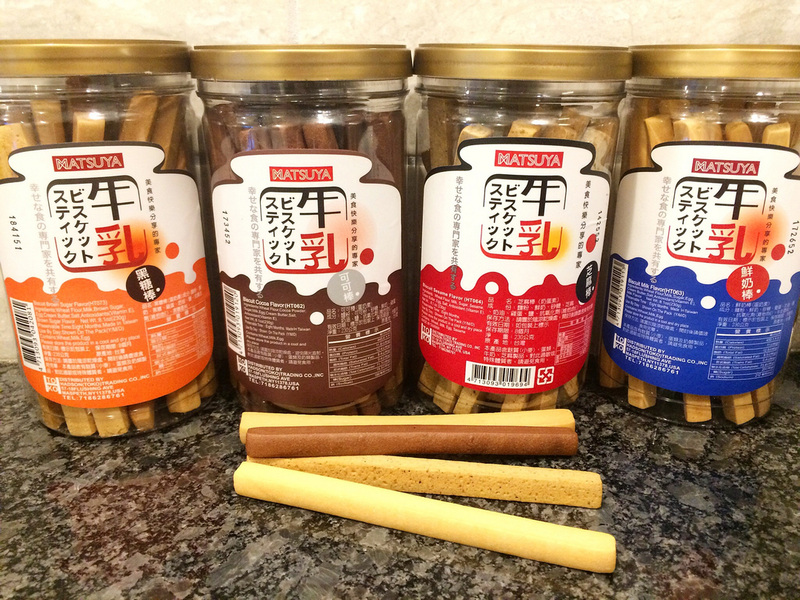 For the language nerds reading this, the Japanese katakana on the label, スティック ビスケット, written vertically in the two columns on the left reads “sutikku bisuketto” (drop the silent letter U’s and you’ll hear “stick biscuit”) and the larger kanji 牛乳 on the right means cow’s milk. They are indeed made with milk or perhaps it means they’re destined to be enjoyed with milk, but that’s as far as my language skills can carry me. 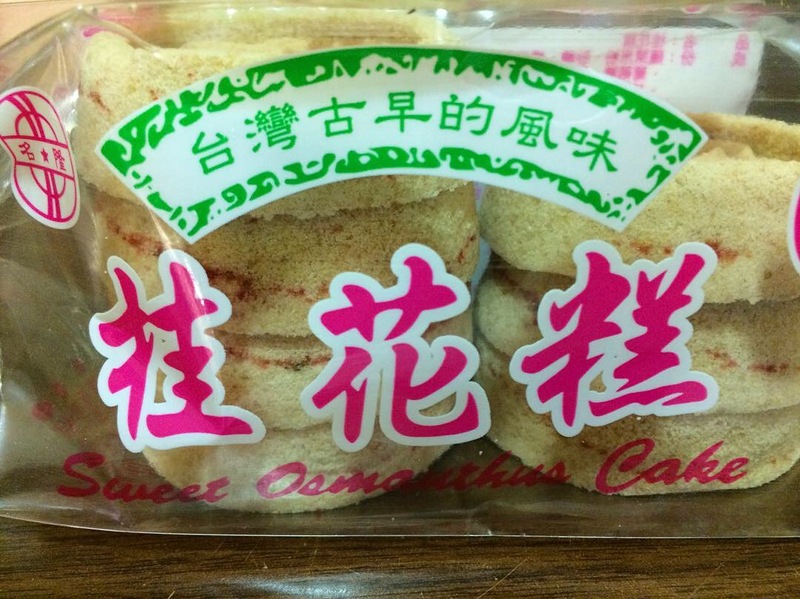 They appear to be manufactured in Taiwan by Matsuya. 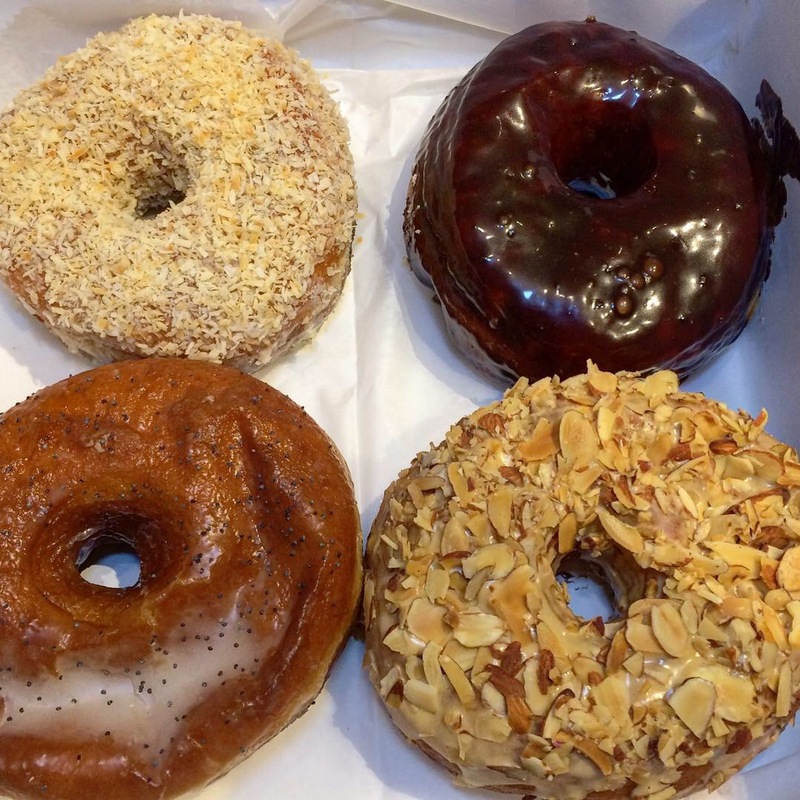 I’ve seen four kinds: brown sugar, cocoa, sesame, and milk. All are good, not too sweet (there’s that phrase again) and rather addictive as much for the taste as the crunchy texture which is about as hard as a cookie can be and still not effect an emergency visit to the dentist. The rigidity adds to the fun, however: my first thought was to plunge them into something harmonious – use the cocoa version to scoop up some peanut butter or dunk the milk variety in Nutella; any dip of similar consistency and yumminess would suffice. There’s a Greek brand of delicious sweet tahini, one type is flavored with chocolate, another with orange (it might be worthy of a post of its own) that was perfect with the sesame flavor. 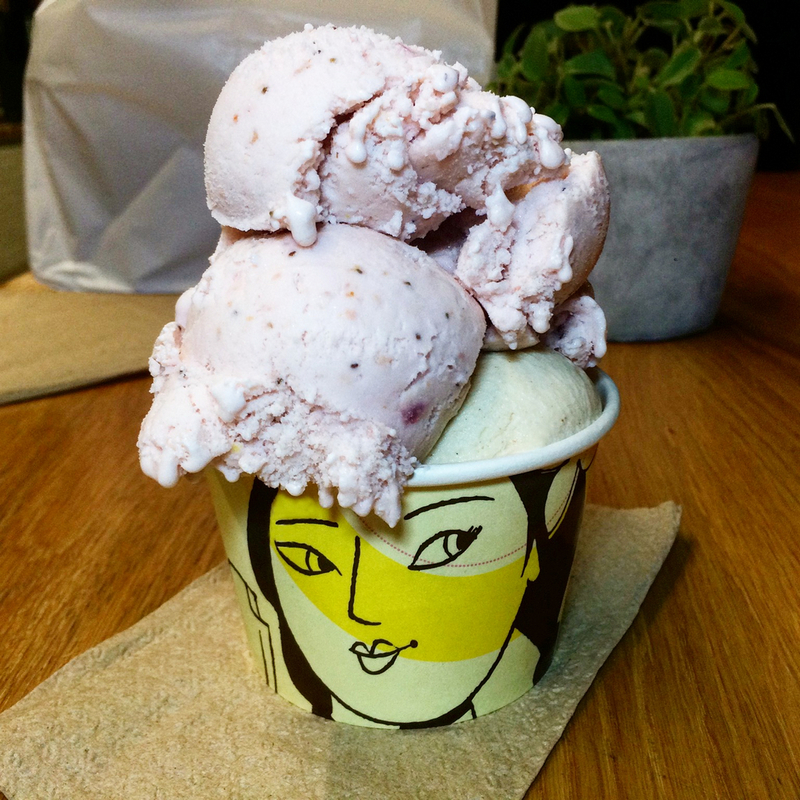 Sort of like Pocky on steroids. And if your sugar high flies too far off the charts, they can be repurposed as playthings as well: think Lincoln Logs. Jenga anyone? 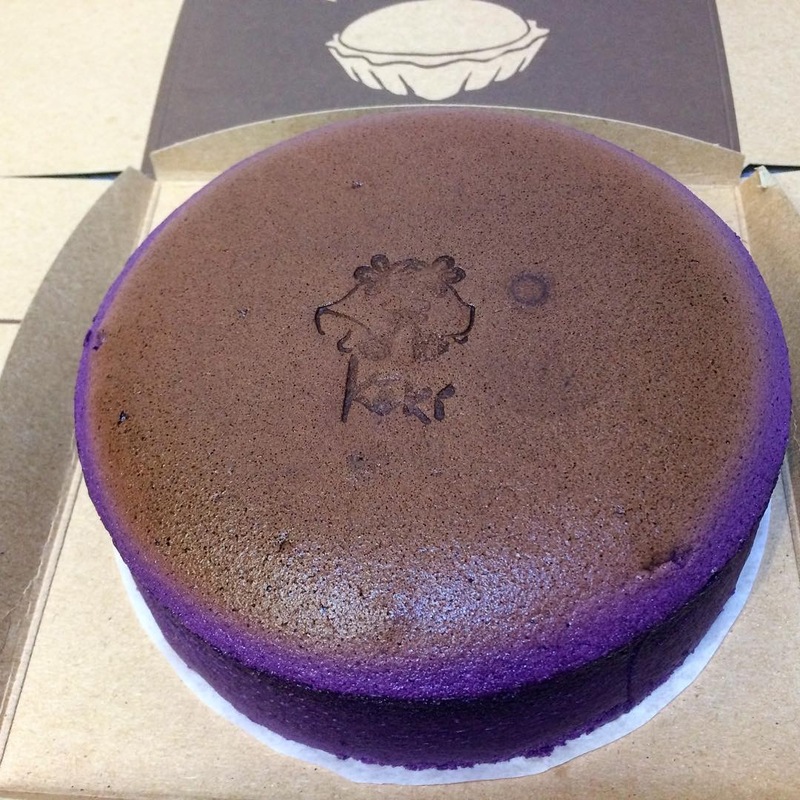 You know the line that formed outside the door the day that Keki Modern Cakes opened at 79 Mott St in Chinatown? I was in it, mainly because they were (unconsciously) utilizing their unusual cakes to demo the mechanics of momentum in the window, and I’m the nerdy type. 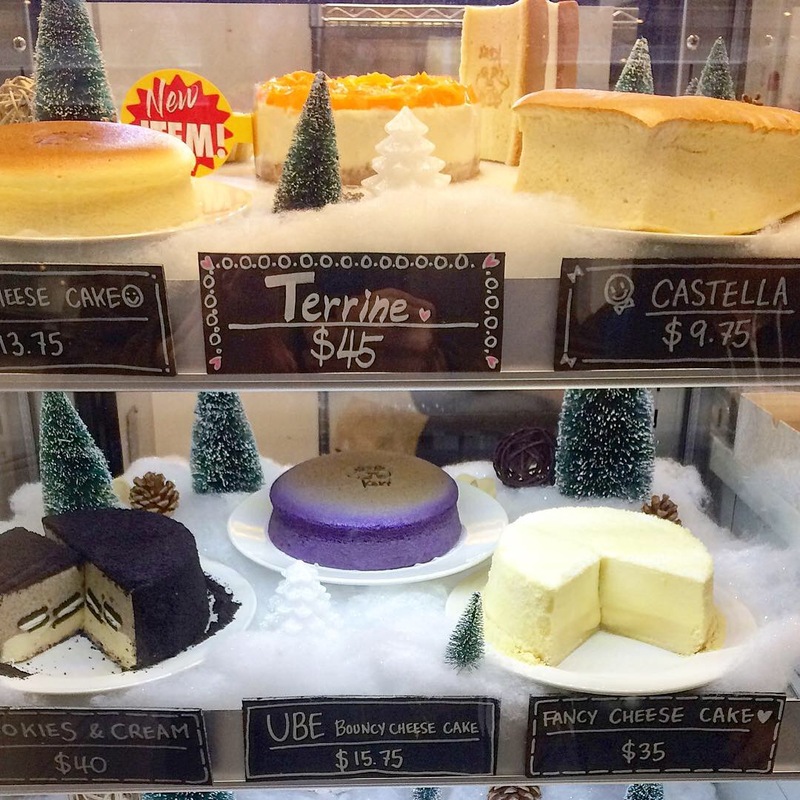 In case you missed it, Keki makes “Bouncy Cheesecakes” and they do live up to the promise of their name. 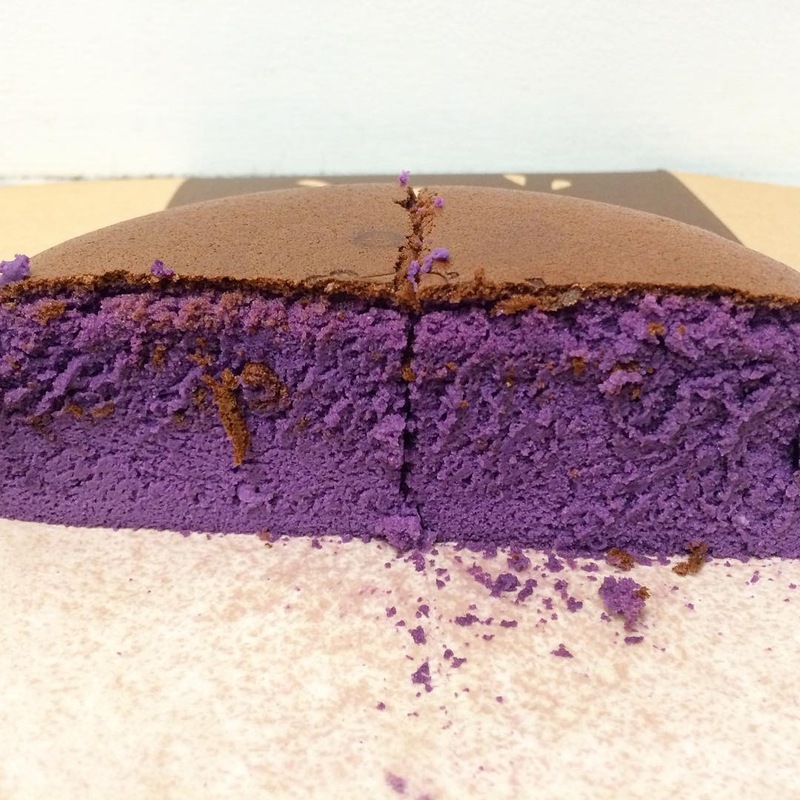 On a postprandial visit to their midtown location, 315 Fifth Ave at 32nd St, my lunchmates and I indulged in the ube variety. 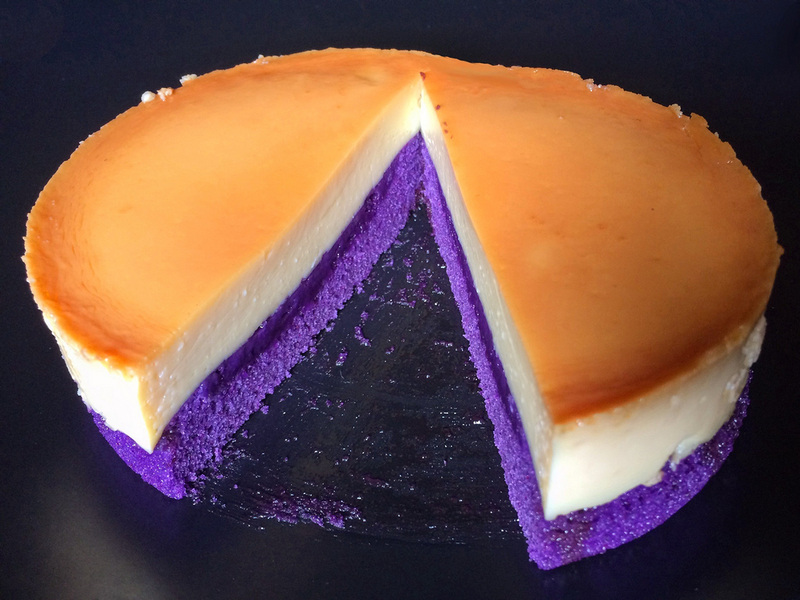 Light, fluffy, adorably jiggly and not too sweet (it seems to be so important to so many), the flavors of cheese and ube were present but subtle. Pretty good, actually. 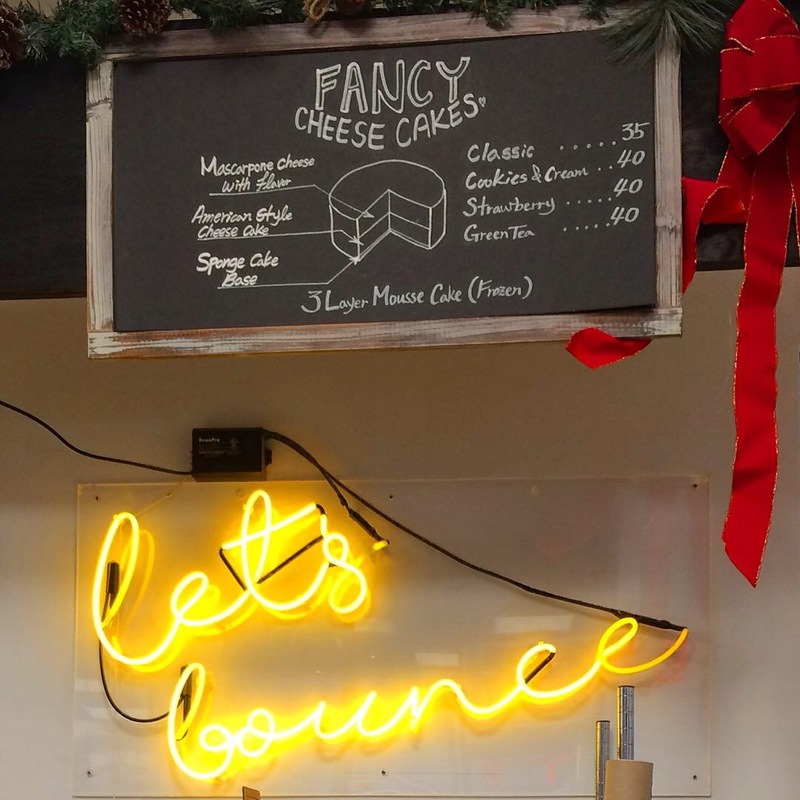 They also offer castella sponge cakes, tarts and “pot pies” that look like larger tarts in flavors like blood orange, melon banana, and pumpkin (these may be seasonal), as well as  fancy cheese cakes, described on a chalkboard just above the yellow neon imperative, “Let’s Bounce”. Sure, why not? 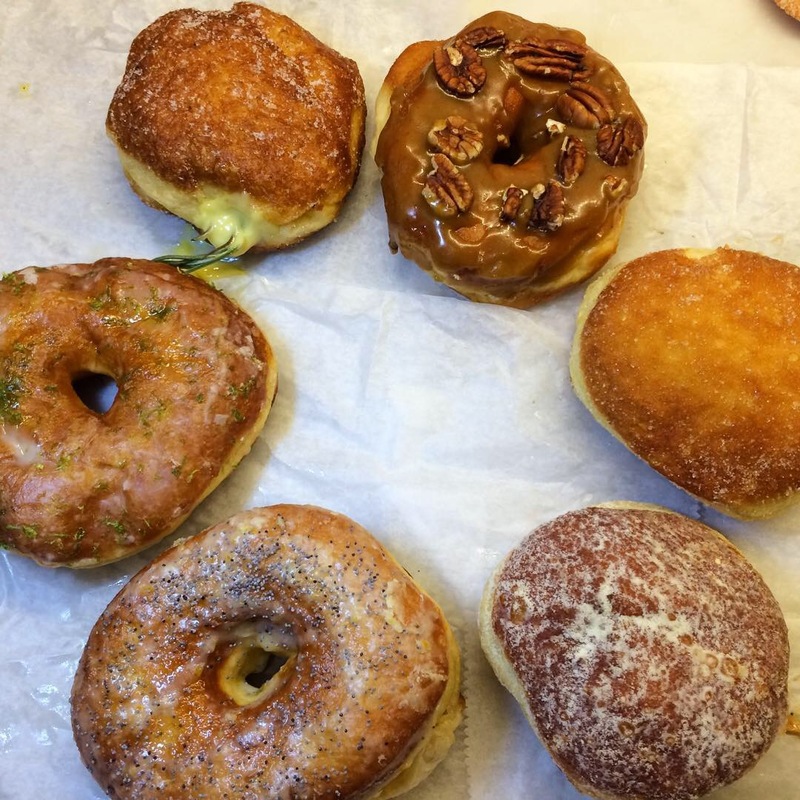 Having recently done a post about a hearty meal we enjoyed in Brooklyn’s Middle Eastern neighborhood, Bay Ridge, I thought it appropriate to follow up with a coda about dessert. 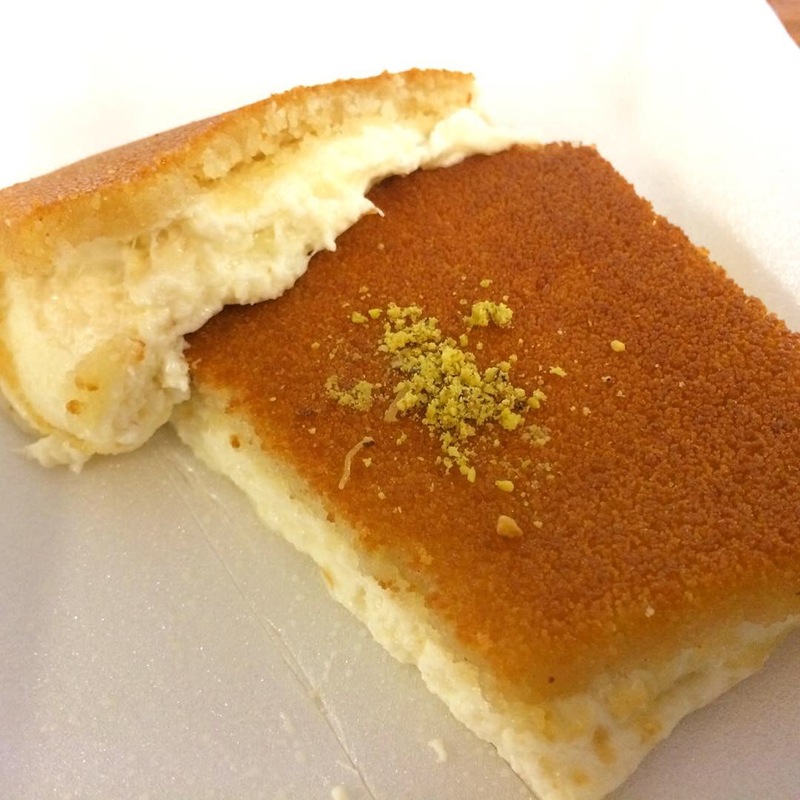 We hit two bakeries that day (there are many more), partly in a quest to see who made the better kanafeh. 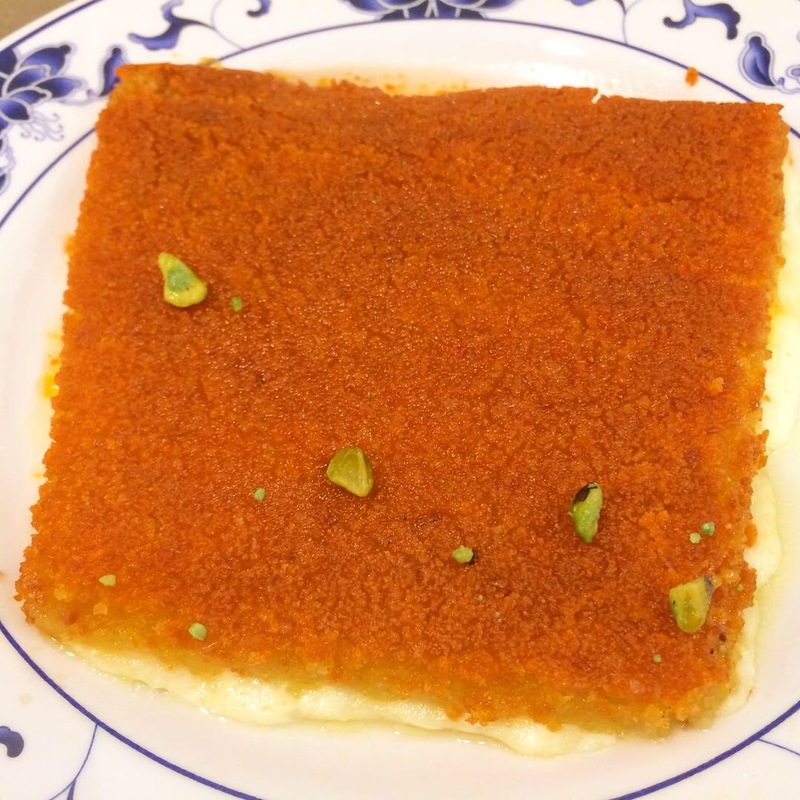 Kanafeh, also spelled knafeh, kunafa, (there are many more), but always reliably كُنافة, is hypersweet and made with sugar syrup-drenched crisp shredded dough that conceals rich delights like clotted cream or cheese and is often topped with chopped nuts. You’ll recognize it easily: Picture a large pizza positioned on its round aluminum pan; now increase its size by, oh, half again as much; now instead of pizza toppings, picture finely shredded noodle-like dough so orange in hue that it would put a fresh carrot to shame; now forget that I said anything about pizza, it’ll only be confusing, but you’ve got the picture. 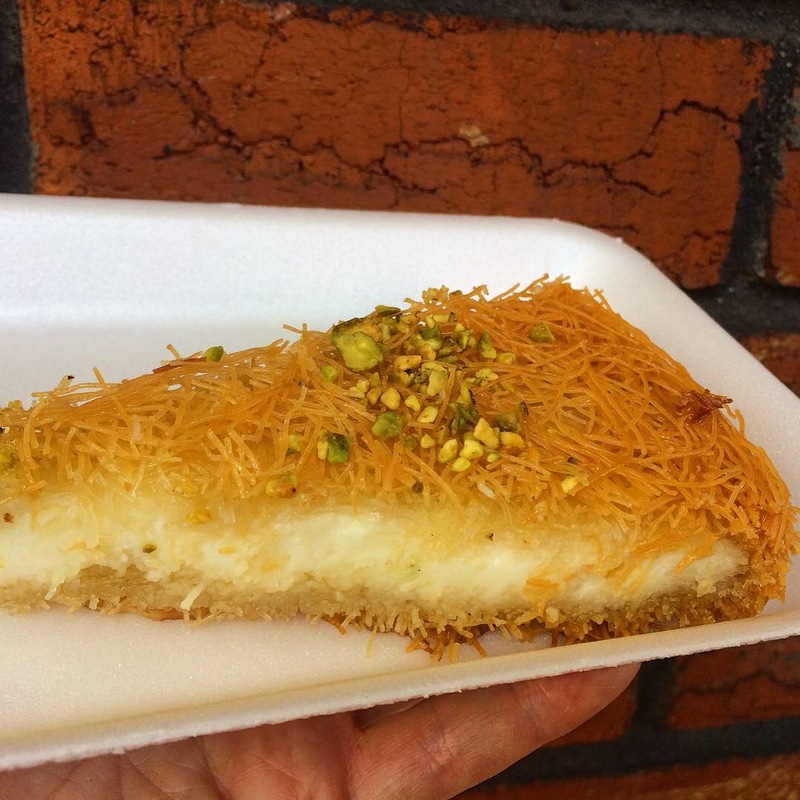 At Cedar’s Pastry and Ice Cream Shop, 7204 5th Ave, we tried two different kinds of kanafeh (there are many more),  mastic/ashta, the hands down winner by my standards, and  cheese. At Nablus Sweets, 6812 5th Ave, where the pans are square – picture Sicilian pizza, now forget I said that – we chose one with cheese and a different topping (there are many more) but I wish we had plumped for one of the other varieties as well. Perhaps one day I’ll bring a few friends and we’ll do a proper smackdown of all the varieties because, as you’ve no doubt discerned…there are many more. I can no longer keep this to myself. I am an addict, hooked on mithai. What’s that? You don’t know about mithai? 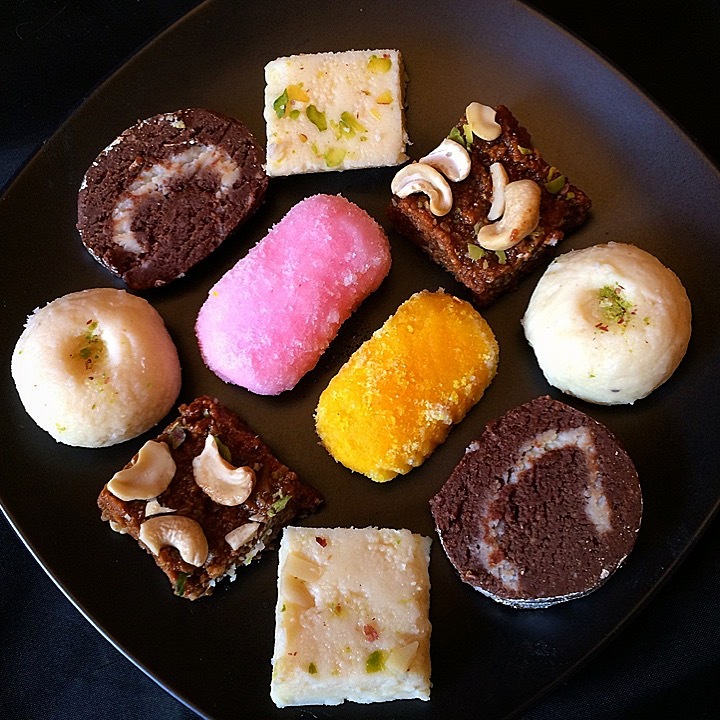 Mithai are Indian sweets and since Diwali, the Hindu Festival of Lights, is upon us, I can think of no better time than now to tell you my tale. 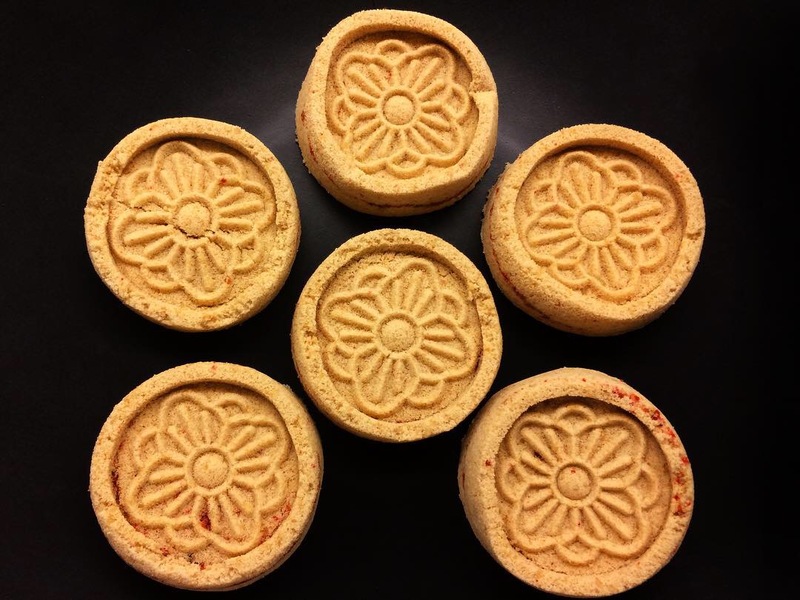 So gather round your diyas and check out my post “Indian Sweets 101: Meeting Mithai” right here on ethnojunkie.com!